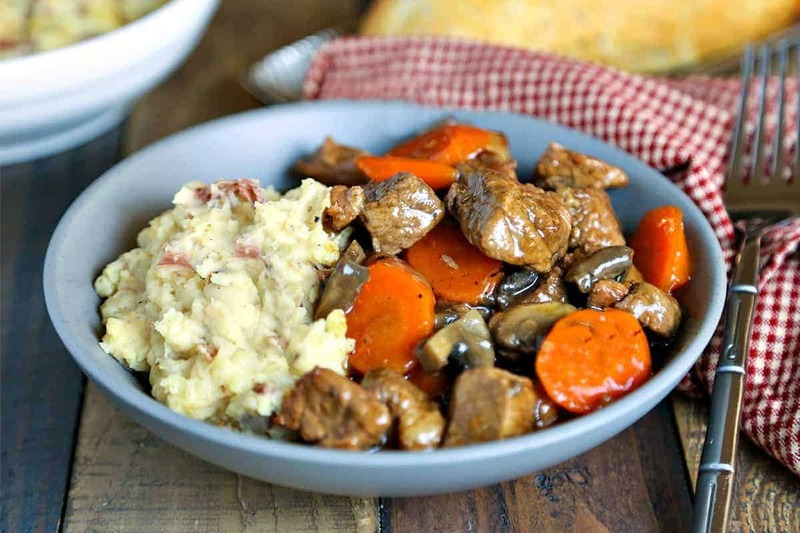 A rich stew of beef, mushrooms, and carrots served over creamy rustic masted potatoes. With the new year, most food blogs are sharing resolution recipes. You know what I mean. Pinterest is blowing up with all kinds of detox drinks, smoothies, and such. And what do you find me sharing today? Mashed potatoes and gravy! 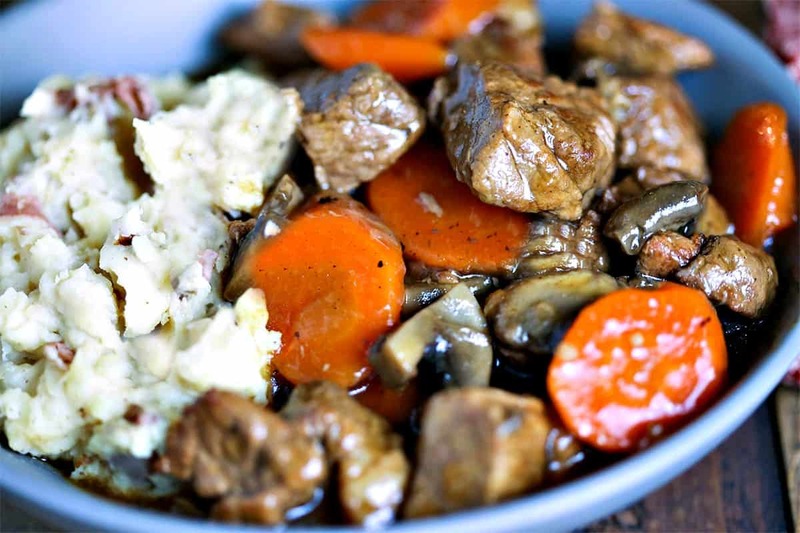 In fact, mashed potatoes and gravy with big chunks of beef, carrots, and mushrooms—a.k.a. 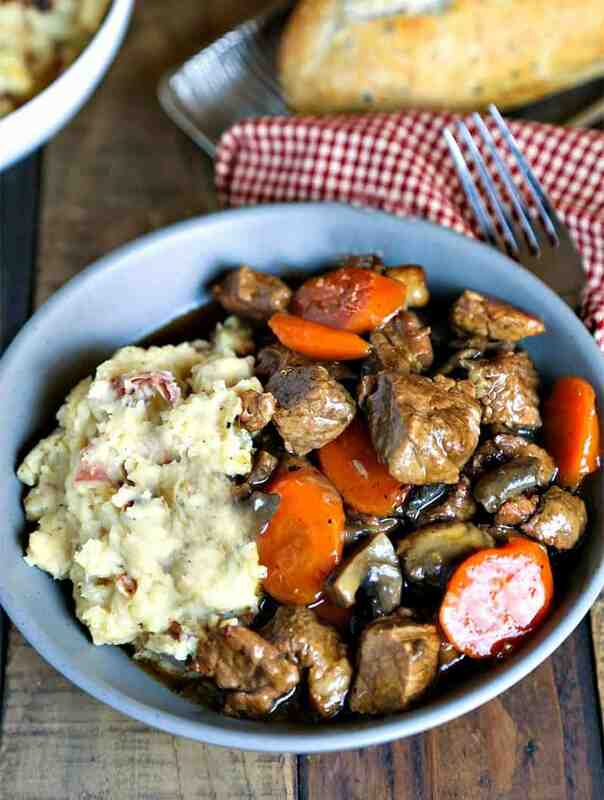 Marsala Beef Stew with Redskin Mashed Potatoes, a hearty stew served over a bed of creamy mashed potatoes. There’s nothing more delicious or filling on a cold, blustery day! I know, I know. This is bad. But, please allow me this indulgence. You see, last year I got serious and started focusing on my eating habits to address my elevated blood pressure. 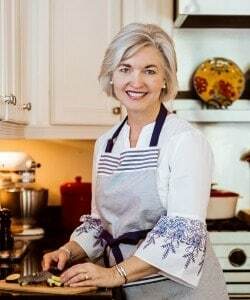 To get it under control, I upped my exercise and followed the dash diet religiously for six months—no salt, no sugar, no carbs, and as my husband likes to say, “no taste.” Really, it wasn’t that bad and my BP came down, I feel much better, and I lost 26 pounds! Think about it. No potatoes for six months. No French fries, no loaded baked potatoes, no boiled potatoes, no smashed potatoes, no potato chips—none! Now, for this farm girl that’s a huge adjustment. So, what’s up with today’s recipe? It’s all about moderation. Lately, I’ve been allowing myself a few indulgent meals—even with potatoes! The key is eating smaller portions and avoiding slipping into old habits. I can’t eat this kind of food every day, but occasionally it’s totally fine for me. 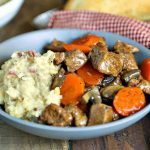 With it being so frigid cold last week, a bowl of this Marsala Beef Stew was just the thing to fill our tummies and warm us up. Even though the stew simmered for a couple of hours (and made the house smell heavenly! ), I decided to take a few shortcuts by using a package of au jus mix and by mashing my potatoes with the skins on—no peeling! I call these Redskin Mashed Potatoes or rustic mashed potatoes. With the skins on there are more vitamins, right? I guess that counteracts the cream! Haha! Don’t worry, I also believe in healthy eating and will still continue to share “healthier” recipes—along with a few indulgent ones. Season stew meat with salt and pepper. Heat olive oil in a dutch oven over medium heat. Add 1 tablespoon butter and stir quickly until melted. Place half the stew meat in the dutch oven and brown on all sides. Remove to a plate and repeat with the remaining beef. Add mushrooms to the dutch oven and saute for 1-2 minutes, just until golden. Remove to a plate and set aside to add to the stew with the carrots during the last 30 minutes of cooking. Add onions and garlic to the pan and cook for 3-4 minutes until soft. Return meat to the pan and sprinkle with the Au Jus mix. Add water and Marsala cooking wine and stir. Bring to a boil, then reduce heat to low. Cover and simmer for 90 minutes. Add carrots and mushrooms to the stew and continue cooking for 30 minutes or until the carrots are tender. 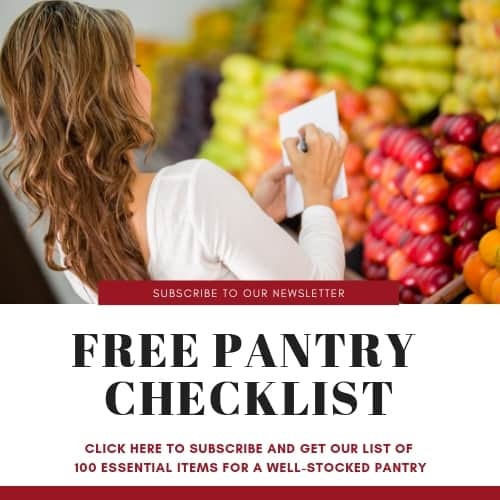 For a thicker broth, mix 2 tablespoons cornstarch with 1/4 cup water and add to the stew; cook and stir for another minute or until the broth is thickened. Wash potatoes and cut into quarters—no need to peel—and place in a large pot. Cover with water. Bring potatoes to a boil over medium heat and continue cooking until tender, about 15 minutes. Drain potatoes and add remaining ingredients. Mash with a potato masher or hand held mixer until creamy, with some lumps remaining. Serve with beef stew.